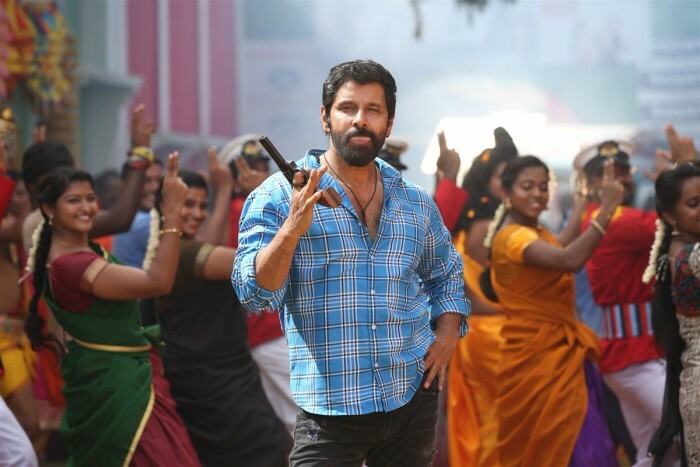 Vikram is class and mass rolled into one in these stills from ‘Sketch’. The suave Vikram is arguably one of the most popular and revered stars in the Tamil film industry today. He enjoys a strong fan following thanks to his good looks, versatile performances, and charming personality and of course tremendous range as an artist. Moreover, he has won hearts thanks to his simple and down-to-earth nature. Now, there is some good news for his fans. As it so happens, some stills from his ‘Sketch’ are creating quite a buzz on the social media and that too for all the right reasons. In them, Vikram can be seen in a suave and uber-cool avatar that he carries off like a boss. His confident body language and bindass expressions gel quite well with his look, upping its recall value in a big way. Now, that’s what we call swag! Vikram truly is a scene stealer. In case you did not know, ‘Sketch’ is touted to be an action-drama and has been directed by Vijay Chander. Besides the ‘Saamy’ star, it also features Tamannaah in the lead. Some time ago, the lovely lady had said that she really enjoyed working with Vikram and loved his on-set discipline. “Vikram is an actor who has been around for long. His knowledge and talent can be well understood through his body of work. Yet every time he works on a new project he is still meticulous about it and is a thorough professional. Be whatever the weather condition, he always reported [on the sets] on time for the shoot. He is very hardworking, disciplined and his energy was addictive. Now I know what makes him one of the best in his field,” she had told a leading daily. Tamannaah is expected to have a strong character in ‘Sketch’ and her chemistry with Vikram could be one of the biggest highlights of the film. A while ago, the director had said that women will really love her role in ‘Sketch’. “Tamannaah plays Ammu, a girl-next-door, and she shares a beautiful relationship with Vikram. Romance is very intrinsic to the script and their chemistry is very relatable. Their characters kind of complement each other. I can say that women who see the film would want to be like Ammu,” the director had told a leading daily. On a related note, this is a busy time for Vikram as well as Tamannaah. Vikram currently also has ‘Dhruva Natchathiram’ in her kitty. It is a spy-thriller and has been directed by Gautham Menon. In it, he will be seen alongside the talented Aishwarya Rajesh. A while ago, the ‘Daddy’ star had praised him and said he has a child-like enthusiasm about him. “Vikram sir is very encouraging… you feel an energy boost when you see him. Being a top hero, he could have easily opted for bigger heroines, but he insisted that someone like me be a part of the film. He keeps giving valuable suggestions and retains that childlike enthusiasm,” she had told a leading daily. Besides Vikram-Aishwarya, ‘Dhruva Natchathiram’ also has actress Ritu Varma in the lead. As far as Tamannaah is concerned, she is gearing up for the release of ‘Queen Once Again’. The film is a remake of the Bollywood hit ‘Queen’ and will see the young lady essay the role played by Kangana Ranaut in the original version. A while ago, she had said that the remake will live up to the high standards set the Hindi version. “Queen’ is an interesting film and I have always been motivated by roles that help alleviate women empowerment in some form. I am very excited to be helming the Telugu version and can’t wait to start shooting next month. This is the first time I’m working with Neelakanta Reddy and I’m sure together we will create magic on the 70 mm screen,” she had added. Besides ‘Queen Once Again’, she also has a film with Kalyan Ram in her kitty. So, did you like these stills from ‘Sketch’? Comments, please!